As an outfielder, Jarred Cosart broke Jay Buhner’s Clear Creek High record for batting average this spring, hitting .506 to Buhner’s .480. But pro teams are more interested in Cosart as a loose, athletic 6-foot-3, 180-pound righthander. He reached 96 mph with his fastball in the fall, but he topped out at 92 this spring. He’s more of a project as a pitcher than he is as a hitter, as he has an awkward pause in the middle of his delivery that compromises his ability to throw strikes or refine his secondary pitches. He wanted top-three-rounds money to sign, which means he’ll likely attend Missouri, where he’ll play both ways. Jarred Cosart is a 2008 OF/1B/3B/P with a 6’3”, 180 lb. frame from League City, TX who attends Clear Creek HS. Tall athletic build, outstanding raw tools, recorded highest velocity ever in a workout from the outfield, quick wrists at the plate, solid middle of the field contact, level swing plane, good raw hitting tools, great actions, solid footwork, unbelievable arm strength, quick clean arm action on the mound, balanced delivery, nice extension, sharp 11 to 5 curveball, curveball is an out pitch, nice sink and run on change-up, feel for three above average pitches, strong student, highest level prospect, potential early round draft pick. PG was obviously more impressed. They rated him a 10.0, which is the highest score given to a prospect. After sliding out of the first few rounds of the draft, he tumbled all the way down to the 38th round where the Phillies took a flier. Its common for teams to take elite high school talent in the last 15 rounds, with the hope that the player either has a change of heart, or something with their situation (college coaching shakeup, personal issue, etc) crops up and they change their mind and decide to turn pro. The story of Cosart’s signing is famous now, his father was sitting in the stands of one of his games right before the signing deadline and hammered out the terms of the deal, and Cosart was then a professional. Cosart made his pro debut this summer while battling minor shoulder issues. He didn’t have any trouble dominating GCL hitters with a fastball that sat at 93-94 mph and a true 12-to-6 curveball. He has a lean 6-foot-3, 180-pound build and works from a three-quarters arm slot. He’s still learning to throw a changeup. Other than that, he simply needs more experience and consistency. Big things were expected heading into 2010, but because he had pitched so little and had dealt with minor injuries, I was cautiously optimistic. 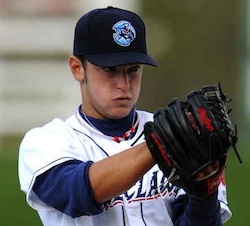 The Phillies sent Cosart, who didn’t turn 20 until late May, to Lakewood, having him bypass the New York Penn League. Cosart performed well, pitching 71.1 IP, striking out 77 and walking just 16 while allowing only 3 HR and rolling up a 55% GB rate. Cosart has again dealt with some minor arm issues, and the Phillies are convinced he will be fine, they are just choosing to be cautious with him because of his tender age and lack of innings on his arm. Pitchers are the highest risk for injury between the ages of 17-23, so protecting an arm as special as Cosart’s is understandable. Arm Strength: 70 – Cosart has exceptional raw arm strength, capable of getting into the high 90’s and holding his velocity deep into games. Control: 60/65 – Cosart has shown excellent control thus far, walking only 16 in 71 IP in 2010, a rate of 2.02 per 9. Command: 55/60 – Cosart has shown the ability to locate down in the zone to generate groundballs, and as he refines his mechanics, his command could improve further. Mechanics: 55 – At draft time, he had a pronounced pause in his delivery which hindered his command. The Phillies have smoothed his delivery a bit and dropped his arm slot slightly to create more movement on his pitches. Durability: 40/55 – Cosart has had injury issues so far in his short career, but at 6’3/180, he has room to grow and add muscle, and should develop a good pitcher’s frame capable of logging 200 innings per season. Secondary Pitches: 50/60 – Cosart has shown a promising 12-6 curveball, and with more repetitions it should become an above average to plus pitch. His changeup is raw, but again, with time it should become at least average, giving him 3 quality ML pitches. Take a look at the video of Cosart, first with his pre-draft video and then a video taken of him in 2010. Notice the better tempo in his delivery, and the lower arm slot. Pre-draft, he threw very much over the top, and is now more of a 3/4 arm slot. The lower arm slot should help him maintain life on his fastball, allowing him to throw 2 seam fastballs in on RH batters and cutters that move in on LH batters. Upside: Cosart has true #1 SP upside. Having just turned 20, he has very little pro experience, right around 100 innings, yet he’s already flashed dominant stuff and the results to back it up against older competition. His fastball is elite, one of the best in the minor leagues, and the only red flag in his profile right now is the injury concern. The Phillies got a clean bill of health on him from noted Dr James Andrews, and insist that he will be fine with rest. In many cases, prep prospects deal with arm soreness and pain in their first full season. Its a major adjustment to get used to pitching every 5th day for 5 months, and its better to be safe than sorry. 2011: Two clips from his 2011 debut here and here. Added video from his 2011 debut on April 7th at the bottom in the videos section. Thanks again for providing them, well done. added a video I came across on youtube from April 22, 2011. He gave up a HR. Still, its nice to have video of our guys. Added under the “Videos” heading above.